29 जनवरी 2013 को ईएसए के वैज्ञानिकों ने बताया कि शुक्र ग्रह का आयनमंडल बाहर की ओर बहता है, जो इस मायने में समान है "इसी तरह की परिस्थितियों में एक धूमकेतु से आयन पूंछ की बौछार होती देखी गई"।"
शुक्र के वायुमंडल की खोज 1761 में रूसी बहुश्रुत मिखाइल लोमोनोसोव द्वारा हुई थी। शुक्र के वायुमंडल का अवलोकन 1790 में जर्मन खगोलशास्त्री योहान श्रोटर द्वारा हुआ था। श्रॉटर ने पाया कि ग्रह जब एक पतला अर्द्धचंद्र था, कटोरी 180° से अधिक तक विस्तारित हुई। उन्होने सही अनुमान लगाया कि यह घने वातावरण में सूर्य प्रकाश के बिखरने की वजह से था। बाद में, जब ग्रह अवर संयोजन पर था, अमेरिकी खगोलशास्त्री चेस्टर स्मिथ लीमन ने इसके अंधकार तरफ वाले हिस्से के इर्दगिर्द एक पूर्ण छल्ले का निरिक्षण किया और इसने वायुमंडल के लिए प्रमाण प्रदान किये। The atmosphere complicated efforts to determine a rotation period for the planet, and observers such as Italian-born astronomer Giovanni Cassini and Schröter incorrectly estimated periods of about 24 hours from the motions of markings on the planet's apparent surface. USSR कॉसमॉस 21 01963-11-11 नवम्बर 11, 1963 Attempted Venera test flight? ↑ अ आ इ ई उ ऊ ए ऐ ओ औ Williams, David R. (15 अप्रैल 2005). "Venus Fact Sheet". NASA. अभिगमन तिथि 12 अक्टूबर 2007. ↑ अ आ इ Espenak, Fred (1996). "Venus: Twelve year planetary ephemeris, 1995–2006". NASA Reference Publication 1349. NASA/Goddard Space Flight Center. अभिगमन तिथि 20 जून 2006. ↑ अ आ इ "Space Topics: Compare the Planets: Mercury, Venus, Earth, The Moon, and Mars". Planetary Society. अभिगमन तिथि 12 अप्रैल 2007. ↑ Lawrence, Pete (2005). "The Shadow of Venus". अभिगमन तिथि 13 जून 2012. ↑ "Caught in the wind from the Sun". ESA (Venus Express). 28 नवम्बर 2007. अभिगमन तिथि 12 जुलाई 2008. 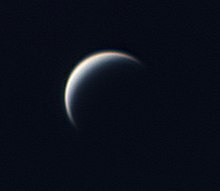 ↑ "Atmosphere of Venus". The Encyclopedia of Astrobiology, Astronomy, and Spaceflght. अभिगमन तिथि 29 अप्रैल 2007. ↑ Esposito, Larry W. (9 मार्च 1984). "Sulfur Dioxide: Episodic Injection Shows Evidence for Active Venus Volcanism". Science. 223 (4640): 1072–1074. PMID 17830154. डीओआइ:10.1126/science.223.4640.1072. बिबकोड:1984Sci...223.1072E. अभिगमन तिथि 29 अप्रैल 2009. ↑ Kaufmann, W. J. (1994). Universe. New York: W. H. Freeman. पृ॰ 204. आई॰ऍस॰बी॰ऍन॰ 0-7167-2379-4. ↑ अ आ इ Frankel, Charles (1996). Volcanoes of the Solar System. Cambridge University Press. आई॰ऍस॰बी॰ऍन॰ 0-521-47770-0. ↑ Batson, R.M. ; Russell J. F. (18–22 मार्च 1991). "Naming the Newly Found Landforms on Venus" (PDF). Procedings of the Lunar and Planetary Science Conference XXII. Houston, Texas. p. 65. http://www.lpi.usra.edu/meetings/lpsc1991/pdf/1033.pdf. अभिगमन तिथि: 12 जुलाई 2009. ↑ Davies, M. E.; Abalakin, V. K.; Bursa, M.; Lieske, J. H.; Morando, B.; Morrison, D.; Seidelmann, P. K.; Sinclair, A. T.; Yallop, B. (1994). "Report of the IAU Working Group on Cartographic Coordinates and Rotational Elements of the Planets and Satellites". Celestial Mechanics and Dynamical Astronomy. 63 (2): 127. डीओआइ:10.1007/BF00693410. बिबकोड:1996CeMDA..63..127D. ↑ "USGS Astrogeology: Rotation and pole position for the Sun and planets (IAU WGCCRE)". अभिगमन तिथि 22 अक्टूबर 2009. ↑ "The Magellan Venus Explorer's Guide". अभिगमन तिथि 22 अक्टूबर 2009. ↑ "Venus also zapped by lightning". CNN. 29 नवम्बर 2007. मूल से 30 नवम्बर 2007 को पुरालेखित. अभिगमन तिथि 29 नवंबर 2007. ↑ Glaze, L. S. (1999). "Transport of SO2 by explosive volcanism on Venus". Journal of Geophysical Research. 104 (E8): 18899–18906. डीओआइ:10.1029/1998JE000619. बिबकोड:1999JGR...10418899G. अभिगमन तिथि 16 जनवरी 2009. ↑ David Morrison (2003). The Planetary System. Benjamin Cummings. आई॰ऍस॰बी॰ऍन॰ 0-8053-8734-X. ↑ Goettel, K. A.; Shields, J. A.; Decker, D. A. (16–20 मार्च 1981). "Density constraints on the composition of Venus". Proceedings of the Lunar and Planetary Science Conference. Houston, TX: Pergamon Press. pp. 1507–1516. http://adsabs.harvard.edu/abs/1982LPSC...12.1507G. अभिगमन तिथि: 12 जुलाई 2009. ↑ Nimmo, F. (2002). "Magellan". Geology. 30 (11): 987–990. आइ॰एस॰एस॰एन॰ 0091-7613. डीओआइ:10.1130/0091-7613(2002)030<0987:WDVLAM>2.0.CO;2. बिबकोड:2002Geo....30..987N. ↑ "The HITRAN Database". Atomic and Molecular Physics Division, Harvard-Smithsonian Center for Astrophysics. अभिगमन तिथि 8 अगस्त 2012. HITRAN is a compilation of spectroscopic parameters that a variety of computer codes use to predict and simulate the transmission and emission of light in the atmosphere. ↑ "Hitran on the Web Information System". Harvard-Smithsonian Center for Astrophysics (CFA), Cambridge, MA, USA; V.E. Zuev Insitute of Atmosperic Optics (IAO), Tomsk, Russia. अभिगमन तिथि 11 अगस्त 2012. ↑ "Venus". Case Western Reserve University. 13 सितंबर 2006. अभिगमन तिथि 21 दिसंबर 2011. ↑ Lewis, John S. (2004). 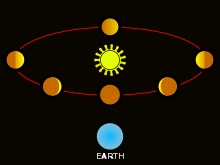 Physics and Chemistry of the Solar System (2nd संस्करण). Academic Press. पृ॰ 463. आई॰ऍस॰बी॰ऍन॰ 0-12-446744-X. ↑ Henry Bortman (2004). "Was Venus Alive? 'The Signs are Probably There'". space.com. अभिगमन तिथि 31 जुलाई 2010. ↑ Kasting, J. F. (1988). "Runaway and moist greenhouse atmospheres and the evolution of Earth and Venus". Icarus. 74 (3): 472–494. PMID 11538226. डीओआइ:10.1016/0019-1035(88)90116-9. बिबकोड:1988Icar...74..472K. ↑ Krasnopolsky, Vladimir A. (2006). "Chemical composition of Venus atmosphere and clouds: Some unsolved problems". Planetary and Space Science. 54 (13–14): 1352–1359. डीओआइ:10.1016/j.pss.2006.04.019. बिबकोड:2006P&SS...54.1352K. ↑ Normile, Dennis (7 मई 2010). "Mission to probe Venus's curious winds and test solar sail for propulsion". Science. 328 (5979): 677. PMID 20448159. डीओआइ:10.1126/science.328.5979.677-a. बिबकोड:2010Sci...328..677N. ↑ "Interplanetary Seasons". NASA. अभिगमन तिथि 21 अगस्त 2007. ↑ Otten, Carolyn Jones (2004). ""Heavy metal" snow on Venus is lead sulfide". Washington University in St Louis. अभिगमन तिथि 21 अगस्त 2007. ↑ अ आ Russell, S. T.; Zhang, T. L.; Delva, M.; Magnes, W.; Strangeway, R. J.; Wei, H. Y. (2007). "Lightning on Venus inferred from whistler-mode waves in the ionosphere". Nature. 450 (7170): 661–662. PMID 18046401. डीओआइ:10.1038/nature05930. बिबकोड:2007Natur.450..661R. ↑ Staff (28 नवम्बर 2007). "Venus offers Earth climate clues". बीबीसी न्यूज़. अभिगमन तिथि 29 नवंबर 2007. 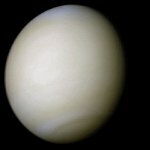 ↑ "ESA finds that Venus has an ozone layer too". ESA. 6 अक्टूबर 2011. अभिगमन तिथि 25 दिसंबर 2011. ↑ Staff (जनवरी 29, 2013). "When A Planet Behaves Like A Comet". ESA. अभिगमन तिथि January 31, 2013. ↑ Kramer, Miriam (जनवरी 30, 2013). "Venus Can Have 'Comet-Like' Atmosphere". Space.com. अभिगमन तिथि January 31, 2013. ↑ Luhmann J. G., Russell C. T. (1997). J. H. Shirley and R. W. Fainbridge, संपा॰. Venus: Magnetic Field and Magnetosphere. Encyclopedia of Planetary Sciences. Chapman and Hall, New York. आई॰ऍस॰बी॰ऍन॰ 978-1-4020-4520-2. अभिगमन तिथि 28 जून 2009. ↑ Bakich, Michael E. (2000). The Cambridge planetary handbook. Cambridge University Press. पृ॰ 50. आई॰ऍस॰बी॰ऍन॰ 0-521-63280-3. ↑ "Could Venus be shifting gear?". European Space Agency. 10 फ़रवरी 2012. अभिगमन तिथि 19 अगस्त 2012. ↑ Musser, George (10 अक्टूबर 2006). "Double Impact May Explain Why Venus Has No Moon". Scientific American. अभिगमन तिथि 5 दिसंबर 2011. ↑ Tytell, David (10 अक्टूबर 2006). "Why Doesn't Venus Have a Moon?". SkyandTelescope.com. मूल से 30 मई 2012 को पुरालेखित. अभिगमन तिथि 3 अगस्त 2007. ↑ Tony Flanders (25 फ़रवरी 2011). "See Venus in Broad Daylight!". Sky & Telescope. ↑ Krystek, Lee. "Natural Identified Flying Objects". The Unngatural Museum. अभिगमन तिथि 20 जून 2006. ↑ Anon. "Transit of Venus". History. University of Central Lancashire. अभिगमन तिथि 14 मई 2012. ↑ Espenak, Fred (2004). "Transits of Venus, Six Millennium Catalog: 2000 BCE to 4000 CE". Transits of the Sun. NASA. अभिगमन तिथि 14 मई 2009. ↑ Kollerstrom, Nicholas (1998). "Horrocks and the Dawn of British Astronomy". University College London. अभिगमन तिथि 11 मई 2012. ↑ Hornsby, T. (1771). 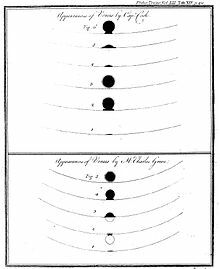 "The quantity of the Sun's parallax, as deduced from the observations of the transit of Venus on June 3, 1769". Philosophical Transactions of the Royal Society. 61 (0): 574–579. डीओआइ:10.1098/rstl.1771.0054. ↑ Woolley, Richard (1969). "Captain Cook and the Transit of Venus of 1769". Notes and Records of the Royal Society of London. 24 (1): 19–32. JSTOR 530738. आइ॰एस॰एस॰एन॰ 0035-9149. डीओआइ:10.1098/rsnr.1969.0004. ↑ Baum, R. M. (2000). "The enigmatic ashen light of Venus: an overview". Journal of the British Astronomical Association. 110: 325. बिबकोड:2000JBAA..110..325B. ↑ Waerden, Bartel (1974). Science awakening II: the birth of astronomy. स्प्रिंगर. पृ॰ 56. आई॰ऍस॰बी॰ऍन॰ 90-01-93103-0. अभिगमन तिथि 10 जनवरी 2011. ↑ Pliny the Elder (1991). Natural History II:36–37. translated by John F. Healy. Harmondsworth, Middlesex, UK: Penguin. पपृ॰ 15–16. ↑ Kollerstrom, Nicholas (2004). "William Crabtree's Venus transit observation" (PDF). Proceedings IAU Colloquium No. 196, 2004. International Astronomical Union. अभिगमन तिथि 10 मई 2012. ↑ Anonymous. "Galileo: the Telescope & the Laws of Dynamics". Astronomy 161; The Solar System. Department Physics & Astronomy, University of Tennessee. अभिगमन तिथि 20 जून 2006. ↑ Marov, Mikhail Ya. (2004). "Mikhail Lomonosov and the discovery of the atmosphere of Venus during the 1761 transit". In D.W. Kurtz. Preston, U.K.: Cambridge University Press. 209–219. doi:10.1017/S1743921305001390. http://adsabs.harvard.edu/abs/2005tvnv.conf..209M. ↑ "Mikhail Vasilyevich Lomonosov". Britannica online encyclopedia. Encyclopædia Britannica, Inc. अभिगमन तिथि 12 जुलाई 2009. ↑ Russell, H. N. (1899). "The Atmosphere of Venus". Astrophysical Journal. 9: 284–299. डीओआइ:10.1086/140593. बिबकोड:1899ApJ.....9..284R. ↑ Hussey, T. (1832). "On the Rotation of Venus". Monthly Notices of the Royal Astronomical Society. 2: 78–126. बिबकोड:1832MNRAS...2...78H. ↑ Ross, F. E. (1928). 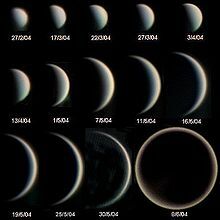 "Photographs of Venus". Astrophysical Journal. 68–92: 57. डीओआइ:10.1086/143130. बिबकोड:1928ApJ....68...57R. ↑ Slipher, V. M. (1903). "A Spectrographic Investigation of the Rotation Velocity of Venus". Astronomische Nachrichten. 163 (3–4): 35. डीओआइ:10.1002/asna.19031630303. बिबकोड:1903AN....163...35S. ↑ Mitchell, Don (2003). "Inventing The Interplanetary Probe". The Soviet Exploration of Venus. अभिगमन तिथि 27 दिसंबर 2007. ↑ Jet Propulsion Laboratory (1962). 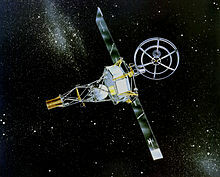 "Mariner-Venus 1962 Final Project Report" (PDF). SP-59. NASA. ↑ अ आ इ ई Mitchell, Don (2003). "Plumbing the Atmosphere of Venus". The Soviet Exploration of Venus. अभिगमन तिथि 27 दिसंबर 2007. ↑ "Report on the Activities of the COSPAR Working Group VII". Preliminary Report, COSPAR Twelfth Plenary Meeting and Tenth International Space Science Symposium. Prague, Czechoslovakia: National Academy of Sciences. 11–24 मई 1969. p. 94. ↑ Mitchell, Don (2003). "First Pictures of the Surface of Venus". The Soviet Exploration of Venus. अभिगमन तिथि 27 दिसंबर 2007. ↑ Williams, David R. (6 जनवरी 2005). 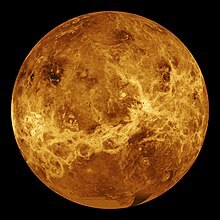 "Pioneer Venus Project Information". NASA Goddard Space Flight Center. अभिगमन तिथि 19 जुलाई 2009. ↑ अ आ इ Mitchell, Don (2003). "Drilling into the Surface of Venus". The Soviet Exploration of Venus. अभिगमन तिथि 27 दिसंबर 2007. ↑ "Magellan begins termination activities". JPL Universe. 9 सितंबर 1994. अभिगमन तिथि 30 जुलाई 2009. ↑ Van Pelt, Michel (2006). Space invaders: how robotic spacecraft explore the Solar System. स्प्रिंगर. पपृ॰ 186–189. आई॰ऍस॰बी॰ऍन॰ 0-387-33232-4. ↑ "Timeline". MESSENGER. अभिगमन तिथि 9 फ़रवरी 2008. ↑ अ आ "Venus Express". ESA Portal. European Space Agency. अभिगमन तिथि 9 फ़रवरी 2008. 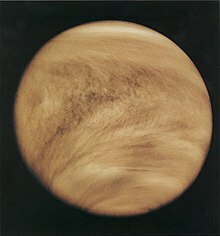 ↑ "Venus Climate Orbiter "PLANET-C"". JAXA. अभिगमन तिथि 9 फ़रवरी 2008. ↑ "BepiColombo". ESA Spacecraft Operations. अभिगमन तिथि 9 फ़रवरी 2008. ↑ "New Frontiers missions 2009". NASA. अभिगमन तिथि 9 दिसंबर 2011. ↑ "Atmospheric Flight on Venus". NASA Glenn Research Center Technical Reports. अभिगमन तिथि 18 सितंबर 2008. ↑ अ आ इ Landis, Geoffrey A. (2003). "Colonization of Venus". AIP Conference Proceedings. 654. pp. 1193–1198. doi:10.1063/1.1541418. http://link.aip.org/link/?APCPCS/654/1193/1.